The Global Volcanism Program has no activity reports for Fort Portal. The Global Volcanism Program has no Weekly Reports available for Fort Portal. The Global Volcanism Program has no Bulletin Reports available for Fort Portal. The carbonatite lavas and tuffs of the Fort Portal volcanic field in Uganda, NE of Mount Ruwenzori between Lake Albert and Lake Edward, consists of a group of tuff cones and maars covering an area of about 145 km2. About 50 volcanic vents, some of which now contain crater lakes, were erupted through basement rocks of Precambrian gneiss in an WSW-ENE-trending area north of the town of Fort Portal. Several additional vents are located in the Kasekere (Rusekere) area to the NE. Radiocarbon dates of about 4700-4000 years ago were obtained from ash deposits from the Fort Portal volcanic field. Holmes (1950) noted that Kasensankaranga Crater in the Fort Portal area means "spewer of roasted material," implying an historical age. Bailey K, Lloyd F, Kearns S, Stoppa F, Eby N, Woolley A, 2005. Melilitite at Fort Portal, Uganda: another dimension to the carbonate volcanism. Lithos, 85: 15-25. Barker D S, Nixon P H, 1989. High-Ca, low-alkali carbonatite volcanism at Fort Portal, Uganda. Contr Mineral Petr, 103: 166-177. Holmes A, 1950. Petrogenesis of katungite. Amer Mineral, 35: 772-792. Holmes A, Harwood H F, 1932. Petrology of the volcanic fields east and south-east of Ruwenzori, Uganda. Quart J Geol Soc London, 88: 370-442. Nixon P H, Hornung G, 1973. The carbonatite lavas and tuffs near Fort Portal, western Uganda. Overseas Geol Min Res, 41: 168-179. Vinogradov V I, Krasnov A A, Kuleshov V N, Sulerzhitskiy L D, 1980. C13/C12 and O18/O16 ratios and C14 concentration in carbonatites of the Kaliango volcano (East Africa). Internatl Geol Rev, 22: 51-57. There is no Deformation History data available for Fort Portal. There is no Emissions History data available for Fort Portal. 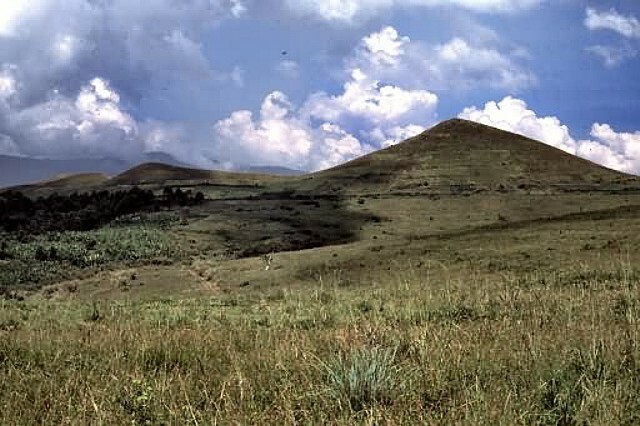 These grass-covered tuff cones are among the many of the Fort Portal volcanic field in Uganda. The carbonatite lavas and tuffs of the Fort Portal volcanic field were erupted from about 50 volcanic tuff cones and maars, some of which now contain crater lakes. Kasensankaranga Crater in the Fort Portal area means "spewer of roasted material," implying an historical age. Photo by Nelson Eby (University of Massachusetts). There are no samples for Fort Portal in the Smithsonian's NMNH Department of Mineral Sciences Rock and Ore collection. Large Eruptions of Fort Portal Information about large Quaternary eruptions (VEI >= 4) is cataloged in the Large Magnitude Explosive Volcanic Eruptions (LaMEVE) database of the Volcano Global Risk Identification and Analysis Project (VOGRIPA).